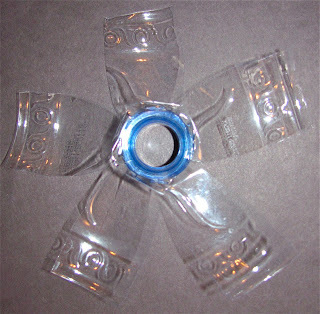 I have a couple versions of these bottle flowers and we did the easier of the two. This is a great recycled project using those plastic water bottles that everyone has or can find anywhere! You could use a soda or any plastic bottle! Be sure to check out my tissue paper version here! Then cut into the ends of the pieces to create petals. 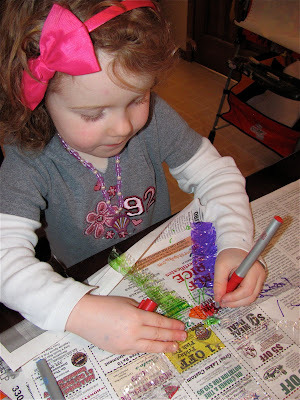 An older child could do this, but you may want to do this for your preschool age child! Cassie could cut a little herself! This is the top of the bottle. It looks to be a different piece from the original picture---but you get the idea? I think I cut this bottle directly in half. Now all you need is some newspaper to protect the table and some permanent markers. You may not think permanent markers and children mix, but I just keep a watchful eye over Cassie and she is fine! She knows she is using Mommy's special art supplies----which is very exciting to her! 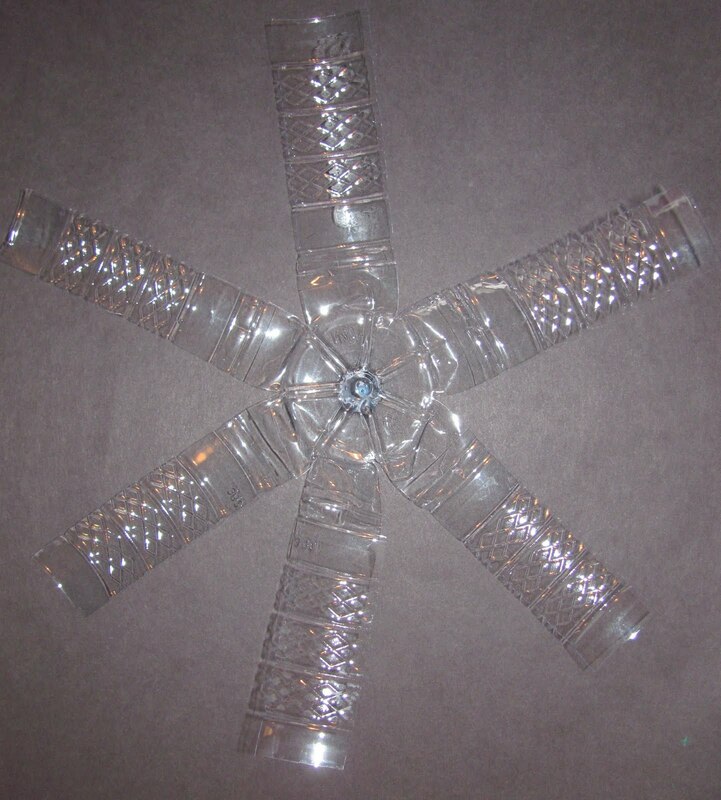 Cassie did an awesome job coloring her recycled bottle flower! I was very impressed! Just punch a hole in one of the petals and attach some yarn and you have a simple easy fun flower sun catcher! We will be working on another version of this to post in the future! My variation with colorful tissue paper can be found here! Enjoy! Check out more recycled projects here! 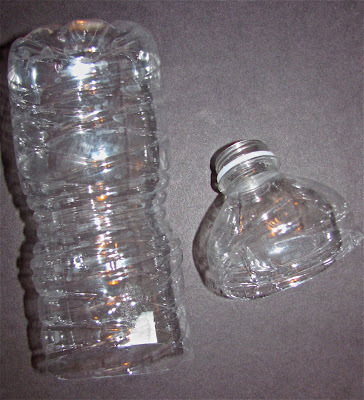 Do you have any ideas for projects with recycled water bottles? Check out Tinkerlab's Plastic Bottle Challenge here! ***It sure would be nice to be in the Top 50 on Babble! Click here and give me a vote! Very fun! They are beautiful. At first I thought you had drawn on the window. I love how bright they are. They look beautiful !!! Love the colors, i first thought u had painted. Love this idea! Will be doing this with my daycare kids. 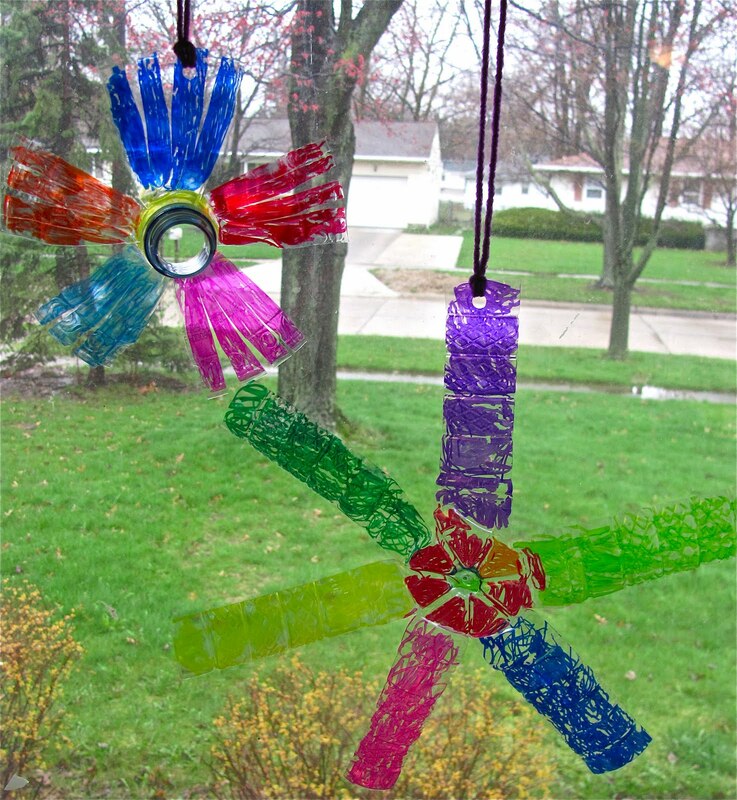 I'll be sure and make these with my children, as I like to use recycled pop bottles for art. These surely would be beautiful to hang as they reflect light, and are pretty to look at. Thanks for popping over today and your comments. Really these suncatchers are great. I would never have thought of doing this myself, such a good idea. They look really lovely outside in the sun! Cassie must have loved doing this, and enjoyed the result of her work as well! Oooh I have JUST bought a set of coloured markers!!! And this is a lovely lovely craft and looks so pretty! Great recycling! Wow!! !very nice way to use recyclable things. Thanks for sharing. Your newest follower. I just shared the link to your blog and this project over at the Zoo. Stop in and check it out. We loved this one! The recycling of plastics and the water and all other resources is very essential.And the right age is to start learning at this tender age so that they are much aware by the time they are adults. Looks like great fun for kids!